Synopsis: The introduction of Bat-Girl begins with Batman, Robin, and Batwoman fighting the Cobra Gang at an exhibit of new scientific equipment. It seems that the Dynamic Trio has thwarted the elements of crime once again, when the remaining member of the gang traps them in an electronic-ring. The criminal begins to tighten the ring, but is felled by a sudden kick from Bat-Girl. After turning off the device, she leaves through the window she came from, leaving Robin to wonder who she is. 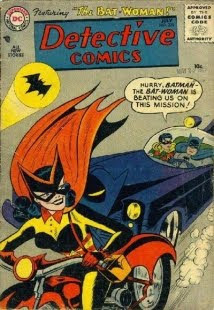 The answer is made clear to Batwoman when she later returns to her Bat-Cave, where her niece Betty stands in the costume. The story then flashes back, showing Betty arriving for a visit and later watching Batwoman capture thieves robbing a school supplies manufactrer on the news. When Betty found gold stars in Kathy's brush, she deduced the truth, made her own costume, and followed Kathy. Kathy is of course worried about her niece getting injured and asks Batman for advice. He suggests that Kathy tell her that she can be Bat-Girl after a lot of training, to stall Betty until she has to leave. Kathy puts this plan into action, having her practice on a trapeze and read books on criminal law. Days pass, with Kathy going out on patrol at night and Betty left to study. One night, she throws a book in frustration and knocks particles loose from one of the Cobra Gang's shoes. Studying them under a microscope, she identifies them as traces of cellulose acetate and sets out to find the Gang's hideout to prove herself to her aunt. She finds the Gang in an abandoned rayon factory and attempts to distract them with a self-inflating balloon so she can lasso them. Her plan backfires when the surprised boss' cigar pops the balloon in her face and the Cobra Gang takes her as a hostage to get their fellows released. At first distraught at the situation due to recklessness, she collects herself and looks for a way to fix things. Cutting some sheets of carbon paper into bat shapes, she sends them out an exhaust vent, which alerts a shoe shiner to call the police. The Dynamic Trio soon arrive and begin subduing the Cobra Gang, but are stopped when the holds a gun to Bat-Girl's head. Bat-Girl fakes fainting and knocks the gun out of his hand, resuming the fight. After the Gang is turned over to the police, Bat-Girl apologizes for her foolishness and Batwoman, accepting that she saw the recklessness in her actions, tells her that she proved herself to be a good crimefighter. Excited, she poses that maybe her and Robin can work on a case together sometime. Asking the Boy Wonder if that's a date, the story ends with Batman and Batwoman chuckling at Robin's embarrassment. Thoughts: In comparison to Batwoman's first story, Bat-Girl's debut introduces the character right. When she first appears, she saves the Dynamic Trio from a criminal's trap without sexist comments about her being a girl. In the flashback, we see Betty noticing that Kathy disappears every night, showing her to be inquisitive before she finds the stars. While the acrobatic and crime training during Kathy's attempt to stall refine and improve the skills Betty could use as a crime fighter, she learned about the cellulose acetate in school, showing a natural intelligence. When the Cobra Gang captures her, she laments how rash her actions were, but then finds a way to get in touch with the rest of the Bat Family rather than stepping backward into being a damsel in distress. This is even more apparent when, with a gun to her head, she fakes a very damsel in distress action and disarms the criminal. Bat-Girl is shown to posses all the ability of a super-heroine without the sexism that Batwoman was saddled with. While Batwoman wanting Betty not to be Bat-Girl may appear hypocritical after Batman had wanted her to stop fighting crime, it should be remembered that Betty is Kathy's niece. Her worry about her getting hurt is genuine, not covered up sexism like in the previous story. And given how much more forward thinking this story is, I would like to think that Batwoman went to Batman for advice because he has had experience raising a youth who is a crimefighter. Speaking of Batwoman, her characterization is much better, fighting alongside Batman and Robin as an equal rather than being viewed as a nuisance. However, her fighting criminals in a school supplies factory is a little suspect and her being unable to figure out Bat-Girl's identity don't reflect well on her. Knocking chairs and boxes of gold stars, as well as flipping criminals over her head, does reflect better than the purse based crimefighting tools of her first appearance. And while Betty has a utility-purse, the self-inflating balloon and Bat-Lasso are also improvements. While Robin still says things like "an inexperienced girl is bound to get hurt pursuing crooks" and "not bad - for a girl," these statements don't come off as sexist as they did when directed at an adult, but as the reaction of a boy to a girl his age. As usual, Sheldon Moldoff brings his cartoony charm to the story's pages. Before I comment on the story, I should say a few words about Batwoman and Bat-Girl's costumes. While Batwoman's costume does not say "creature of the night" like Batman's does, but I do like how it is distinct from his. While the color scheme for Batwoman's costume might strike one as oddly different, the colors of Bat-Girl's costume match Robin's. This matches her up with her counterpart in the Dynamic Duo, while still staying unique. As far as the designs of the Cobra Gang, they begin as entertaining wearing scaly hoods and capes along with traditional comic book criminal suits. Then, the boss shows up in a full cobra hood costume and you know Moldoff had a blast drawing Gotham criminals that offered more creativity than the norm. In this story, there was a distinct piece of art that stuck out as a mistake and one that caught me by surprise. The mistake occurred in the scene with the balloon, where in one panel the balloon flies to the left of the panel as Bat-Girl enters from the window on the right side of the panel. In the next panel, Bat-Girl is suddenly on the left side and getting dazed by the balloon popping, rather than her approaching from the right side. However, the panel where the Cobra Boss holds a gun to Bat-Girl's head caught me by surprise, as I didn't expect for a Silver Age comic at this time to allow something so mature. This story has been reprinted in Batman Annual #7, the Batman From The 30s to The 70s HC, and the DC Comics Classics Library: The Batman Annuals Volume 2 HC. Synopsis: The debut of Batwoman begins with Batman and Robin heading towards a new air terminal after the Bat Signal shines in the sky. Unbeknownst to them, the criminals are already being subdued by the Batwoman. She is handcuffing the crooks by the time the Dynamic Duo arrive, running off afterward with the pair in pursuit. They try to catch up to her in the Batmobile, but her Bat-Cycle loses them in a narrow alley. The next night at a world premiere, the Batwoman prevents a diamond thief's robbery, once again racing away. The rest of the jewel gang attempt to get the drop on the Dynamic Duo while they search for Batwoman, but once again she is there to save them. Later, Robin laments that she is making the Caped Crusader look bad, but Batman does not care about that, worried instead about the risks the Batwoman is taking. At that moment, Batwoman is returning to her own Bat-Cave, located in an old mine tunnel in the suburbs. After changing out of her costume, Batwoman is revealed to be an heiress named Kathy Kane. Reflecting back, we find out that she was a skilled circus trapeze and motorcycle stunt performer who wanted to use her skills to fight crime like Batman. After inheriting her uncle's fortune, she builds a mansion, outfits a Bat-Cave with equipment underneath it, and adopts the super-heroine identity of Batwoman. Back in the present, Bruce Wayne attends a party at Kathy Kane's mansion, where Batwoman comes up in the conversation. Bruce and Kathy appear to hit it off, but abruptly say goodbye to each other when the Bat-Signal appears in the sky. They reunite as Batman and Batwoman at the "Tomorrow Club," where dodging fake Martian idols leads them to respect each others acrobatic skill. Batwoman is able to throw a net on the criminal, but not before he knocks out Batman when the Caped Crusader jumps between Batwoman and the giant robot hand the crook was operating. Batwoman has the opportunity to discover Batman's identity, but does not as he got knocked unconscious saving her from getting hit. Batman comes to as Robin arrives; the Caped Crusader proceeds to interrogate the criminal, who refuses to talk. Despite his silence, Batman deduces that he must have been a distraction so that his boss Hugo Vorn could commit a crime elsewhere. His suspicions are confirmed when he sees an advertising blimp heading towards the mint. The Dynamic Duo and Batwoman arrive as the mob lands, immediately leaping into action. Using her shoulder-bag strap as a makeshift Bat-Bolo, Batwoman ties up Vorn as he makes for the blimp, which Batman apparently sees as giving her the right to turn the mob over to the police. In reality, Batman left her to it so he could use circus terms she spoke earlier to discover her identity. Back at the Bat-Cave, an analysis of the Dynamic Duo's files not only uncovers her identity as Kathy Kane, but where her Bat-Cave is located. 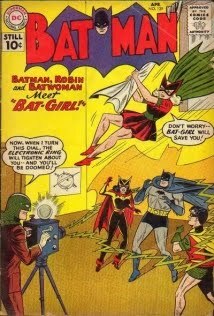 The pair confront her when she returns and Batman convinces her to give up her career as Batwoman. The story ends with Batwoman's portrait from her Bat-Cave hung in Batman's trophy room, with Robin wondering if one day they'll fight crime with her as a Dynamic Trio. Thoughts: This story is an important one for the era, as it is the first appearance of Batwoman, but it is also deeply flawed. Theses flaws come from the fact that the Comics Code Authority at the time had guidelines that were inherently sexist when it came to female characters. As Michael Uslan cites in his introduction to Batman In The Fifties, "The inclusion of females in stories is specifically discouraged. Women, when used in plot structure, should be secondary in importance, and should be drawn realistically, without exaggeration of feminine qualities." As a result of this stance, Batwoman does not come across as a full character. The story begins with one of the crooks saying, "Ha ha, what can she do?," before the other crook is knocked out by Batwoman spinning a giant globe. This showing of Batwoman as a capable super-heroine in the face of sexism is short lived, as she subdues the other criminal using a powder puff from a shoulder bag and then chains the two together with charm bracelets disguised as handcuffs. These gadgets continue, as she stops the diamond thief by reflecting light in his face using a compact-mirror and a perfume flask containing tear gas stops the rest of the jewel gang later. While I can understand wanting to differentiate Batwoman's equipment from Batman's, this was not the way to do it. The making light of Batwoman because she is a woman is not limited to the criminal, but extends to the Dynamic Duo too: Robin says "A girl saving you? It's ridiculous!" and Batman himself says "This is no place for a girl." While Kathy being inspired by Batman to use her acrobatic skills to fight crime is fine, his picture on her desk in the next panel introduces a romantic angle that is unnecessary. At the party, Kathy asking "how any woman could ever equal the great Batman," Bruce suddenly voicing admiration for Batwoman's courage, and the two lamenting if only they could tell the other of their costumed identities, furthers the wrong ideas of the story. Its attempt to show Batman wanting to end Kathy's career as Batwoman because he fears for her safety, not because she has made him look bad as Robin sees it, just comes across as more sexism. This is furthered as his reason for Kathy to give up crime fighting, if he uncovered her identity eventually a criminal would, is an unlikely one. It is shown to be an even poorer reason in the next panel, as Kathy is revealed to have assembled cameras and instruments to take photos, x-rays, and height and weight records that would allow her to uncover Batman's identity, showing how intelligent she is. That Batman hangs her portrait in the Bat-Cave at the end just adds insult to injury. While the story shows that Kathy Kane had the intelligence and acrobatic skills which would make her a fine super-heroine, the sexism of the time that pervades it prevented the character from achieving that status. This story has been reprinted in Batman Annual #4, the Batman From The 30s to The 70s HC, the Batman In The Fifties TPB, and the DC Comics Classics Library: The Batman Annuals Volume 2 HC.